As we age, the visible changes are manifested on a number of levels: skin may become loose and inelastic, jowls become deeper and more pronounced, the neck slackens, and the youthful volume from the upper cheek region and mid-face decreases. Restoring youthful beauty with a facelift takes all of these elements into consideration. The best approach is always one that re-establishes facial harmony and a refreshed appearance. Endoscopic Facelift is one of the myriad techniques available to rejuvenate the face. Most surgeons use endoscopic technology to perform all types of facelifts. Endoscopic techniques are especially useful in mid and lower facelifts, since these procedures target smaller areas that are harder to access with traditional surgical instruments. Additionally, because the incisions are smaller, patients who choose endoscopic techniques usually enjoy a faster recovery time. For many patients, an endoscopic face lift represents a relatively inexpensive, convenient alternative to traditional cosmetic surgery. Because the endoscopic approach is less invasive, it also involves fewer risks and a shorter recovery period than Traditional facelift procedures. Sometimes cosmetic problems are limited to a few specific areas of the face. In such cases, highly focused surgery can accomplish dramatic improvements while remaining far less invasive than traditional face lift procedures. This is particularly true when people are relatively young, or roughly in their 30s, 40s, or 50s. An endoscope is a microscopic camera, attached to a small, handheld wand. To perform an Endoscopic Facelift, a doctor will create three micro incisions. He will then insert the endoscope through one incision to obtain a clear view of the underlying facial structure. Through other two incisions, he will use tiny surgical instruments to lift the muscles and remove excess tissue. Endoscopic facelifts are typically best when patients want to address drooping muscles and misplaced fat, but they do not have a large amount of excess skin. Once the incisions have been made, the surgeon performing the endoscopic face lift inserts a thin wand-like device below the surface of the skin. Equipped with a small camera, it allows the procedure to be seen on a monitor while the surgeon works. Small surgical instruments are then introduced through the remaining incisions. 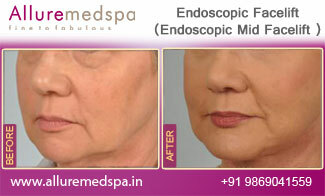 These are used to remove excess fatty tissue and to reshape facial muscles and tissue that have become loose over time. In this way, many of the key factors contributing to sagging or drooping in the face are resolved. Because they are so small, the incisions made during an endoscopic face lift allow much greater flexibility regarding where surgical instruments may be used. This makes it easier to aesthetically modify even traditionally hard-to-reach areas. Dr. Milan Doshi is a board certified cosmetic surgeon who is highly specialized in facial surgery procedures. He takes an extraordinarily detailed approach to each procedure, and believes there is no such thing as a standard facelift. Instead, he customizes every facial surgery to the needs of the patient. It is Dr. Doshi’s ultimate goal to maintain the patient’s natural beauty. Equipped with unparalleled knowledge of the underlying structures of the face and vast experience in dealing with delicate facial nerve, the expertise of Dr. Milan Doshi makes Allure MedSpa one of the most favored destinations of patients seeking Face Lift from all over the world. General anesthesia is commonly used for an endoscopic mid-facelift. Doctors can perform facelifts under local or general anesthesia. IV sedation, which will induce a twilight sleep, is also an option. All three choices are very safe. The best person to decide is your plastic surgeon after a thorough examination and consultations with you. After an endoscopic mid-facelift, patients typically experience minimal discomfort which can easily be controlled with pain medication. The head should be elevated for the first few days to help minimize swelling. Allure MedSpa which is renowned for its state-of-the-art internationally acclaimed services, offers affordable and cost effective cosmetic procedures. To know more about the cost of your procedure request a consult by filling the form below. Your consultation is your chance to ask questions about Face Lift and put our mind at rest. Your surgeon will be able to offer you full explanations and answers to all of your queries. I am 54 year old. As we age our skin tends to get loose and saggy. Same thing has happened with me. My skin also started sagging. I was very worried about it. Therefore, I was searching about some procedure in the internet and I came to know about the endoscopic face lift. The surgery takes few hours and is performed with local anesthesia and sedatives to give relaxed surroundings to the patients. It requires one or more cuts less than one inch long. The incisions are made above the hairline or behind the ear wherever possible. The procedure is scar less and gives an amazing result. I was searching through some clinics who undertake such procedure. There I came to know about Dr.Milan Doshi and Allure Medspa in India. I made a call to the clinic and the staff gave me all the details about the surgery as well as the cost. The cost is quite affordable and I am quite happy about that. I landed in India and went to Allure Medspa. Dr. Doshi after a checkup suggested me to come next day for the surgery. I did that. I was sent to the surgical room for the surgery. After infusing anesthesia, the surgeon started the surgery. After I woke up after an hour, I saw the difference on my face. The incision was too small. It was almost next to invisible. After few weeks of the surgery, I could feel that my face has become firm and smooth. My looks have improved. So, all thanks to Allure Medspa. The best candidates for an endoscopic face lift are people with moderate facial imperfections caused by excess fatty tissue and facial muscles that have begun to loosen. Many patients have sagging cheeks, visible lines around the nose, and thin, downturned lips. Typically, they still have somewhat supple akin; are in their 30s, 40s, or 50s; and don’t have large amounts of sagging skin. It is also important for prospective patients to have a realistic understanding of what this type of face lift can achieve. Becoming well informed about how the procedure can and cannot improve various cosmetic problems is the first step in deciding on this potentially scar-less approach to face lift surgery. The head should be elevated for the first few days to help minimize swelling. To ensure a safe surgical procedure, a thorough medical history is taken to make sure that you don't have any medical conditions that may pose a problem to during your Endoscopic Facelift procedure..
You should plan to take one weeks off of work, so swelling and bruising can resolve. If your job is very strenuous, you may need more time to ensure healing is well underway. Note: We do not ask for any advance payments or deposits. We are pleased to offer and arrange comfortable lodging, restaurant, and commuting to ensure a memorable pre-and post-surgical experience for our out-of-country patients. Please feel free to contact the Counsellor Book a counseling session for assistance with any of your travel and planning needs. After an endoscopic mid-facelift, patients typically experience minimal discomfort which can easily be controlled with pain medication. Swelling and bruising may typically fades with better looks within a few weeks. Endoscopic Facelift produces longer lasting results than other facelifts. No cosmetic procedure can stop the effects of time and aging. However, the results of a facelift can last for years, and even when lines and wrinkles do start to appear, you may still enjoy a more contoured and defined face for life. Will a facelift make me look stretched? No, but the ultimate result depends heavily on the skill and experience of your cosmetic surgeon. In the early days of facial plastic surgery, the standard technique used was to pull the skin back, trim off the excess and then close the incisions. Modern plastic surgery techniques have advanced tremendously. Today we are using sophisticated methods of lifting and tightening underlying muscle, and restoring lost volume for a more natural looking outcome. For the right candidate, facelift surgery is now also very commonly combined with a neck lift. One of the most common reasons for a neck lift is to tighten the loose fold of skin under the chin. This skin is called the “turkey wattle”. Addressing this restores the underlying muscle structures. 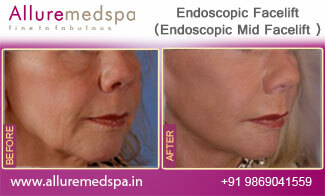 How is the endoscopic mid-facelift procedure performed? After anesthesia is administered, tiny incisions are placed inconspicuously within the hairline at the temple and inside of the mouth. An endoscope is inserted into the incisions to help guide the surgeon as he or she elevates the fat pads of the cheeks as well as the fat and deeper tissues. The incisions are then closed with sutures. Are there scars after an endoscopic mid-facelift? There is no visible scarring after an endoscopic mid-facelift as very tiny incisions are inconspicuously placed inside of the mouth and within the hairline at the temple. Is an endoscopic mid-facelift a painful procedure? Discomfort after an endoscopic mid-facelift is typically minimal and easily controlled with pain medication. An endoscopic facelift is a surgical procedure that provides a natural, more youthful and refreshed appearance to the face. The procedure is done to reposition sagging cheeks, softening smile lines, reducing lower eye hollowness, elevating the corners of the lips, and restoring cheek fullness. Yes, it is a safe surgery. A surgeon will discuss about the pros and cons before conducting the surgery. A surgeon like Dr. Milan Doshi will discuss about its side effects during the consultation process. Who are the candidates for this surgery? The candidates want to undergo the procedure should be healthy man or woman who has realistic expectations. Those patients who want to improve the appearance of sagging or sunken cheeks, smile lines, lower eye hollowness, and sagging corners of the lips. The procedure is done by patients who are in their late thirties to early sixties. The surgery will take only an hour and you can visit home the same day. How the surgery is conducted? It is performed with local anesthesia and sedatives to give relaxed surroundings to the patients. It requires one or more cuts less than one inch long. The incisions are made above the hairline or behind the ear wherever possible. The size and the placement of the incision results in scar less face lifts. After the incision is made, the surgeon inserts a wand-like device below the layer of the skin. The device is equipped with a camera which allows the surgeon to keep a constant eye on the procedure. Other small surgical devices are used in the process to remove extra facial muscles and tissues that have loosen up over the years. The procedure therefore gives a lifted as well as a smooth skin. Recovery period will vary from person to person. However, it will take a week to recover from the surgery. Bruising and little bit of swelling will be there, which is pretty normal. Your surgeon will provide medication and suggest diets and exercises for faster healing after the surgery. What is the cost of endoscopic facelift surgery? For an estimate on how the facelift surgery will cost, we recommend you to call us on +919869041559 or fill an enquiry form so that we can contact you for detailed discussion.